The companion Weimaraner can find itself filling many different roles. Select one of the links attached to this page, and learn more about the choices. You will also meet a few of the OwyheeStar Weims and see how they enhance their owner's lives. Above Jamie (along with Reggie and Daizy) get ready for a sprint. 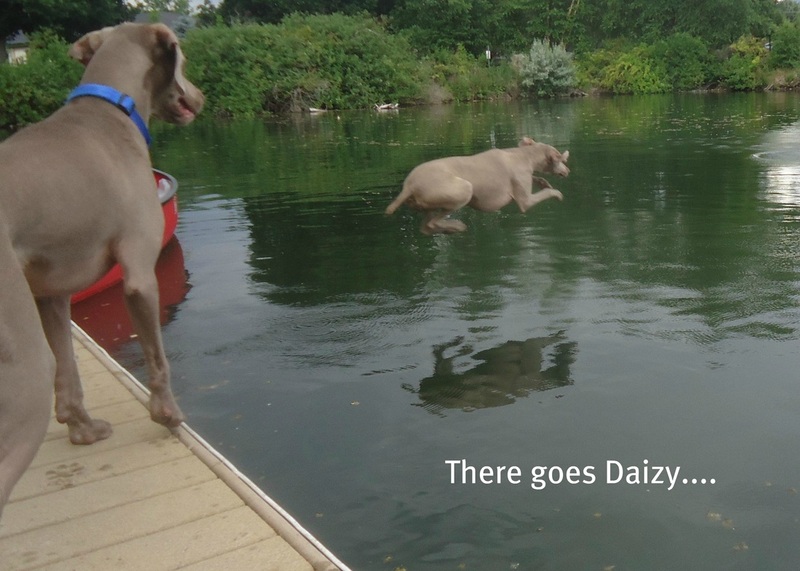 If you live in and around Boise, you might run into this Weim-loving family any number of places--including at the dock. They could be dock-diving, and just swimming. Jamie is an all-around extreme athlete. Many Weims never see this kind of action, and they do fine. They do require some exercise, and a lot of attention. A good balance is healthy for them. It is of course important to keep fit, and not to let them get over weight. Pat Hastings (a long-time dog expert) cites being over weight as affecting your best friend's longevity. Five pounds could potentially shorten his or her life a year or longer. So, some activity is good.